Hello lovelies, today I decided to do something different that being a book review. Growing up as a child, I was obsessed with reading, I was literally reading all the time. I was obsessed with Jacqueline Wilson, Enid Blyton, Stephanie Meyers and Derek Landy. Catching me without my nose stuffed in a book was rare. However as I started to get older, and as I went into secondary school I found that I stopped reading, maybe it was because I didn't have as much time as I would have liked. Nevertheless, I had to do more to start reading. One of my all time favorite YouTubers has to be Tyler Oakley, he is just so funny, down to Earth and in my opinion slaying YouTube at the minute.He has just over eight million YouTube subscribers. If you have never watched one of his videos, please do and I guarantee you won't be disappointed. So, when I heard that he was releasing his own book, I needed it. So for my Christmas present my sister got me 'Binge' by Tyler Oakley, I was so so happy. I got this book at Christmas, and because I am an exam year I didn't have as much time as I would have liked to read it, so since at the moment it is the Easter Holidays, I made it my mission to read it. I literally ramble so much, let's just get in to itttt. So this is what the book looks like, I love the cover of this! It looks so personal and unique, and can I just point out how amazing Tyler's teeth are? Also, sorry that this picture isn't the best quality, my camera died and I just used my phone. This book from what I take are some stories that have happened during Tyler's life. It's not an autobiography or a memoir. Without giving too much away, they are just stories that he hasn't told in his YouTube channel. The topics vary from relationships, eating disorders, One Direction and loadssss more. This book had me laughing and crying more times then I can count. It is so well written, and I'm not just saying this because I love Tyler I genuinely loved it. There are definitely some serious topics in here, and some not serious. And I think that is what makes the book. You get a personal side to Tyler, a side you may have never seen before. I feel like the positive stuff and the not so positive stuff balances the book out. There are moments in the book where I can definitely relate to Tyler, he puts everything in an understandable way. And as a bonus he is just hilarious and so down to earth, I've said that already but it's so true. This book definitely kept my interest, I wanted to find out what story he had next to tell! He has got such a lovely way of telling the story even in the book, you can just hear his voice as he tells it because it comes so much from himself, and the book just screams TYLER. I've only been watching Tyler's videos for nine months which of course isn't a long time compared to other people. However, they have been such an amazing nine months. Whenever I feel sad or anxious I can just watch one of his videos, read a chapter in his book or watch his documentary which is called SNERVOUS (WHICH IS ON NETFLIX). Tyler's laugh alone can make me smile, it's so unique and he is just incredibly funny. If you're somebody who doesn't like reading as in actually holding a book, no problem. You can get this book on Audible. This basically instead of having to read the book your self, you can listen to someone read it to you. 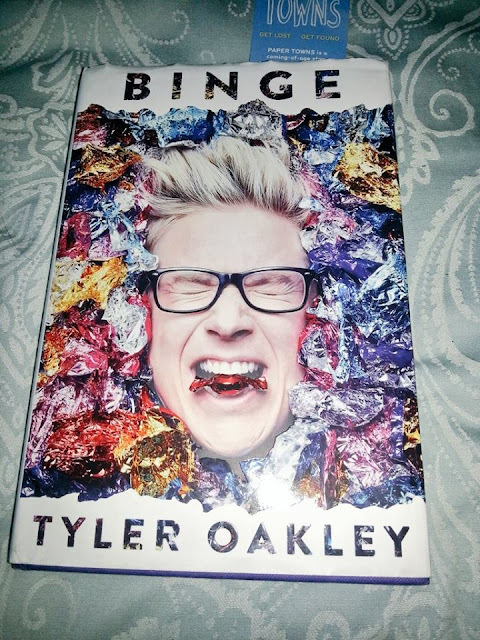 From what I've heard, it is amazing on Audible because Tyler is literally reading the story to you, I'm pretty sure if you use audible.com/tyleroakley you can get your first book FREE. I hope I have convinced you to get this book, I just want to point out that just because I love it, that doesn't mean that you will. But if you love Tyler, you will love this. I hope you enjoyed this, I'm not the best at book reviews not going to lie. I really do love this book.